At United Bus Sales, we are proud to offer you StarCraft’s family of commercial buses over 10 different product offerings. The picture below is just one of our offerings and we can build a bus for you up to 45 passengers. Safety, performance, and durability is what has made Starcraft North America’s largest shuttle bus company. Safety is a primary focus at Starcraft Bus. From the 3,000 lbs. seat-pull test to the rigorous 7-year/200,000 mile Altoona testing, passengers can be assured that the Allstar surpasses the most stringent testing. Bus operators can relax knowing that the fully welded steel cage construction offers the best passenger protection. Durability does not come easily or quickly. The Allstar has been time tested for close to a decade. The 33,000-plus Starcraft buses on North America’s roads offer a billion reasons why the Allstar has become a favorite, and those reasons are called miles. The Allstar is engineered to accommodate a variety of seating arrangements including wheelchair accessibility and various storage options for luggage. At United Bus Sales, we are also proud to offer you Metro Link commercial buses. Extensive research and development has resulted in key product features that separate Metro Link from the competition. Direct body-to-frame mounting improves strength, while fully welded, tubular steel framework creates a durable body structure. Metro Link’s true one-piece fiberglass roof lessens maintenance and virtually eliminates potential leaks. The large frameless windows create a sleek look and reduce air noise. 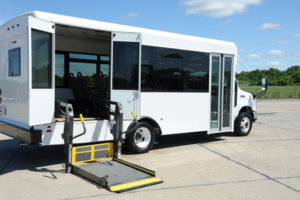 Established in 2013 Metro Worldwide is a leading manufacturer of the Winnebago Metro Link cutaway shuttle and paratransit buses. United Bus Sales will serve your transportation needs for small to large private operators as well as public transit agencies. Our focus is on a superior product that meets the rigors of our customer’s demanding applications. Metro’s advanced design and construction also provides maximum passenger and driver comfort with the quietest ride you’ll find in a midsize bus. As a bonus, your operating budget will look better than ever with key components that are designed for ease of replacement if damaged.